The first time Edwardsburg got its hands on the football, they were able to move smartly down the field and score, utilizing almost invisible handoffs to a backfield of swift runners out of an old fashioned T formation backfield. Score was 6-0 before much time had elapsed from the starting bell, but missing on an attempted two point conversion. Vicksburg almost immediately threw an interception on the Eddies 40 yard line and again they marched down the field after a personal foul penalty against the Bulldogs gave them momentum. Score was now 14-0 without kicking the extra point, instead running the ball in with 1:14 left in the quarter. Quarterback Dalton Ketelaar took over for Vicksburg in the second quarter, almost willing his successive runs to pick up first downs to keep the drive alive. His pass to Hunter Van to the Eddies 25 yard line was a key play. He was hurried on the next pass to Van but got it off just in time to find Van all alone in the corner of the end zone. Score 14-6 with the extra point try negated due to a fumbled snap. Things seemed to be looking up until Edwardsburg brought the kickoff to its 45 yard line and moved right down the field once again for a big score, using their lightning fast backs against a defense that just couldn’t contain them. Score now 20-6 with the two point conversion try no good once again. With the clock running down in the first half, Ketelaar was engineering a nice drive until he was forced out of the pocket, and threw an interception in the end zone with 1:09 left before the teams left to regroup at half time. The Bulldogs barely touched the ball in the second half, as the Eddies dominated. Several Vicksburg players got dinged up, but came right back on the field, determined to turn things around. It wasn’t to be as they only had the ball for two possessions while Edwardsburg scored a touchdown at the 6:03 mark in the third quarter and another score in the fourth quarter to ice the game at 34-6. WATERVLIET – Fans on both sides of the field were on their feet and yelling. After more than 47 minutes of back-and-forth football, the fate of a District title boiled down to one play. Schoolcraft was five yards from the goal line and in need of a touchdown to potentially tie the game and force overtime. On fourth and goal with 36 seconds left in the contest, Schoolcraft’s resilient sophomore quarterback Ricky Clark took the ball, stepped back and looked for a receiver. His options were few and in the milliseconds before his jersey was in the grasp of a Watervliet defenseman, Clark heaved a desperation pass into the end zone. Clark was on the ground after releasing the ball, but knew the result of his toss based on the deafening roars from the Watervliet stands and the jubilant reaction of the opponents hovering around him. 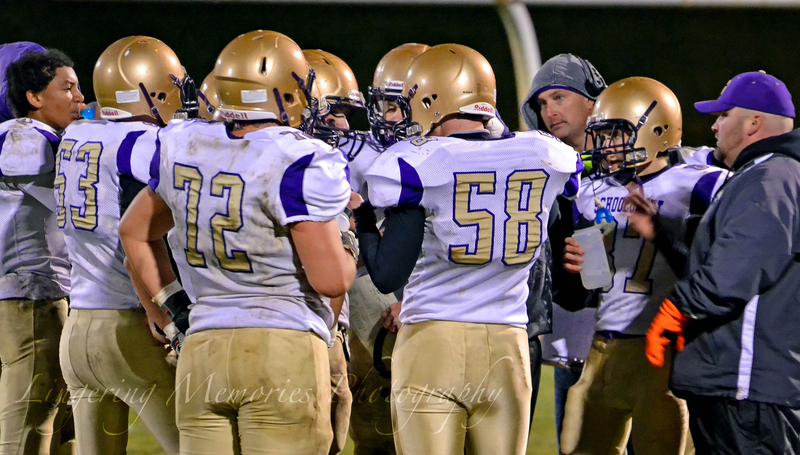 On a cold, breezy November night not far from the Lake Michigan shoreline, with one final desperate lob, Schoolcraft’s 2014 football season ended with a 7-4 record. In a Division 6 game that featured no shortage of an aerial assault and some momentum-changing turnovers, Schoolcraft fell, 28-21. For the second week in a row, a single play figured a substantial role in the final result. Six days earlier in Constantine, it was a questionable call on a punt that officials ruled bounced into a Falcons player. Schoolcraft fell on the live ball and it scored the game-winning touchdown on the subsequent play. At Watervliet Nov. 7, Schoolcraft found itself clinging to a one-point lead early in the fourth quarter. On fourth and 19 at its own 38, Schoolcraft sent Clark out to punt. A muffed snap, however, forced Clark to drop a knee to the ground in order to help secure the ball. Clark made the punt but officials whistled the play dead once he had possession of the ball. By high school rule, the play was dead as Clark’s knee was down and Schoolcraft essentially turned the ball over on downs. Watervliet was awarded the ball at the spot of the down and covered the 30-yard distance in five plays for the go-ahead score with just over five minute to play. To be sure, the loss was far from Clark’s fault because of one play, coach Terry Haas was quick to note. If anything, Clark was a one-man wrecking crew whose strong play on both sides of the ball kept the Eagles in the game. Things got off on a good note for Schoolcraft, as Adam Marshall recovered Watervliet’s fumble on the third play of the game. The Eagles took advantage of the short, 20-yard field and scored in two plays, capped by Josh Zemek’s one-yard run following his 19-yard dash on the previous play. On its subsequent possession, Schoolcraft squandered an opportunity to put the Panthers in a hole early. Aided by a 77-yard run by Clark, the Eagles were two yards from the end zone, but a fumble was recovered by Watervliet and returned to the 23-yard line. The Panthers capitalized on the miscue, as they scored in 13 plays. A missed extra point, however, helped Schoolcraft retain a 7-6 lead after one quarter. Schoolcraft extended its lead to 14-6 early in the second quarter, set up by senior Chadd Marks, who nabbed what was likely the easiest interception of his prep career on a head’s-up play. In nine plays, Schoolcraft covered 37 yards and scored on a 10-yard run by Clark. The series was highlighted by Clark’s 11-yard run on a fourth-down play. Despite a monster, eight-yard sack by Thomas Meadows on Watervliet’s subsequent series, the Panthers used 12 plays and plenty of passing to close its deficit to 14-12 at the half. Watervliet’s Blake Kiekenapp, in fact, completed 25 of 35 passes for 242 yards. All three numbers are an anomaly at the high school level. After giving up a third-quarter touchdown and falling behind, 20-14, Schoolcraft regained the lead, 21-20, on the first play of the fourth quarter with Clark’s one-yard run. The series included a 19-yard reception by Caleb Anspaugh, a 17-yard run by Clark on a fourth-down play in Watervliet’s territory and a 23-yard pass play by Zac Sharp. Clark ended the night with 22 rushes for 156 yards and went seven for 22 for 114 passing yards. Sharp led all Schoolcraft receivers with four catches for 60 yards total. On its final possession of the night, Schoolcraft converted on two fourth-down plays to keep alive its hopes for a potential tying score before running out of gas five yards short of the end zone. Haas said Schoolcraft found itself going up against a team loaded with talented players and plenty of playmakers. Haas said with five sophomores, including Clark, on the varsity squad, he looks forward to the 2015 season. 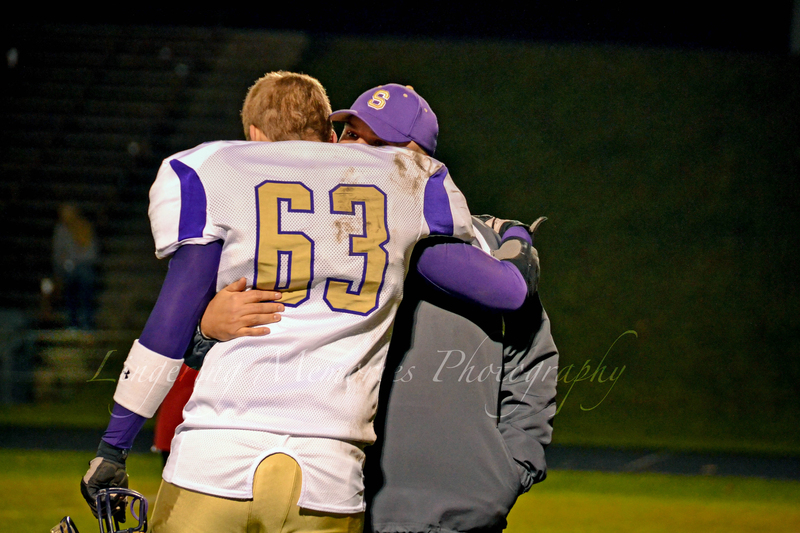 Haas, confirmed though he is retiring as a teacher, he plans to return to coach the Eagles next year. The squads won’t have to wait long for a rematch, as they will be conference opponents in 2015. Watervliet, 10-1, will play at 10-1 Grand Rapids North Pointe Christian next weekend. Schoolcraft football players celebrate a big win over Constantine. In a back-and-forth game that featured big plays on offense and even bigger plays on defense, a turning point in the Nov. 1 pre-district matchup between Schoolcraft and Constantine boiled down to a single incident on special teams. With the score tied at 28, Schoolcraft was forced to punt on fourth down early in the fourth quarter. Constantine was poised to let the ball come to rest, but officials ruled a Falcon player touched it, making it a live ball on which a Schoolcraft player had fallen. Officials huddled and held a lengthy discussion before ruling the ball, indeed, was live and Schoolcraft would maintain possession. On the next play, quarterback Ricky Clark dashed 20 yards for what would be the game-winning touchdown. While Constantine head coach Shawn Griffith nearly exploded in animatedly telling the referee his player was blocked into the ball – a move that would have negated the live ball ruling – Schoolcraft coach Terry Haas saw the play differently. In the end, Schoolcraft earned revenge against a team that handed it one of its three regular-season losses, and left Constantine with a 42-28 come-from-behind win. While the game-defining play was a critical moment, it did not overshadow a stellar offensive clinic by Clark and two of the biggest sacks Chadd Marks will ever have in his high school prep career. Clark ran for two touchdowns and passed for another two to account for the majority of Schoolcraft’s points. In all, Clark led the team with 102 yards rushing and completed six of 16 pass attempts for 73 yards in the air. Afterward, a humble Clark said the playoffs have a way of bringing out the best in Schoolcraft. “We had a big win versus Reed City a week ago, so that helped with our momentum,” Clark said, noting Reed City was a one-loss team before bowing to Schoolcraft the week before. Marks, meanwhile, secured Schoolcraft’s lead with a sack of Constantine’s Matt Hasbrouck on fourth and 12 with less than three minutes to play. Marks struck again on Constantine’s final possession of the game, sacking Hasbrouck once more for a big loss one play before Zac Sharp picked off a Hasbrouck pass with 33 seconds to play. “Quite amazing, but we believed all along we would win,” Marks said. Haas said it did not surprise him that Marks stepped up at a time when Schoolcraft needed a big defensive play. Schoolcraft opened the scoring with a 10-yard reception by Zac Sharp. Down 14-7 in the second quarter, the Eagles made a defensive touchdown on a fumble recovery for 19 yards by Sam Rice. In the third quarter, Schoolcraft tied the game at 21 on a 15-yard reception by Sam Rice, then tied it again at 28 with a 15-yard, pinball-like run by Clark. Schoolcraft finished the scoring with Clark’s run after the scrutinized play involving Constantine’s receiving team, and then a 9-yard run by Sharp with just over a minute to play. The Eagles continue their season with a district title on the line against Watervliet. 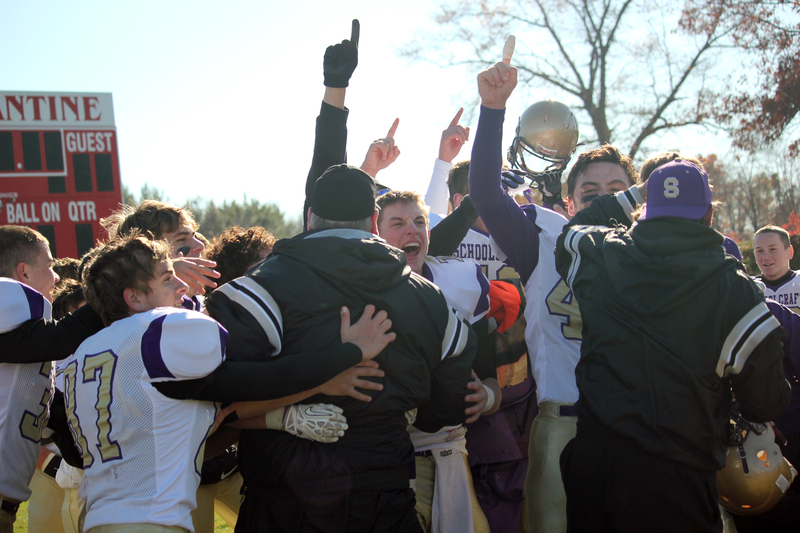 Schoolcraft topped Watervliet, 28-26, in last year’s District contest. Vicksburg Wins its First Playoff Game – Ever! Vicksburg’s defense played a big part in the win against Three Rivers. Photo by Holley Cousins. “It was a great game,” Coach Tom Marchese said after the excitement of winning with only 58 seconds left on the clock in the Friday night Halloween thriller over Three Rivers. A missed extra point by the Wildcats ended the game at 14-13 for a Vicksburg hard-earned victory. The Bulldogs played stellar defense to stop Three Rivers’ running back and quarterback who had burned them with slicing runs and good passing in their first meeting during regular season play. This time, Vicksburg’s interior line didn’t let up, allowing very few long gains, with a grinding it out style of play on an evening with wind gusts that might have gotten up to 30 mph, according to Marchese. The passing game consisted of short passes in the flat for both teams until a couple of longer passes that went for points on the board that gave each team an opportunity to win. The first quarter saw Vicksburg score its first TD with 1:55 left in the quarter on a nifty pass from Dalton Ketelaar for 35 yards to Connor Henderson in the corner of the end zone. After that, the teams exchanged punts several times without getting their ground games going past mid-field. In the second quarter Three Rivers started on Vicksburg’s 27 yard line after punts into the wind fell short. A penalty moved the ball to the eight-yard line and the Wildcats ran the ball right into the end zone for a 7-7 tie. Vicksburg’s defense came alive when a Three Rivers punt was fumbled and the Wildcats took over with a first and goal to go. A Three Rivers penalty pushed the ball back to the 22-yard line and a fourth and 20 saw a desperate pass into the end zone broken up by Caleb Kudary. The teams went into the locker room tied at the half. Three Rivers came out on the attack after the half and drove downfield on its opening possession to Vicksburg’s 17 when the defense again stopped them from scoring. Vicksburg took over on its own 17 with Nick Wallace running hard and Ketelaar scrambling to keep the drive alive that eventually stalled. A long pass to Brenden Lovell took the Bulldogs to the Three Rivers 30, but they couldn’t punch it in and punted to the 18 where Three Rivers took over. The visitors couldn’t move the ball much farther and an attempted punt from about the 20 was blocked by Henderson. The Bulldogs still couldn’t capitalize as they kept going backwards with penalties that hurt them and hard tackling by the Wildcats. Late in the fourth quarter, Vicksburg started its winning drive from the 50 with Wallace advancing the ball to the 23 with some hard running. Ketelaar rolled out to his left and let go a quick pass to Hunter Van for a completion to the eight-yard line. This time Wallace took the ball over with 3:55 left in the game. 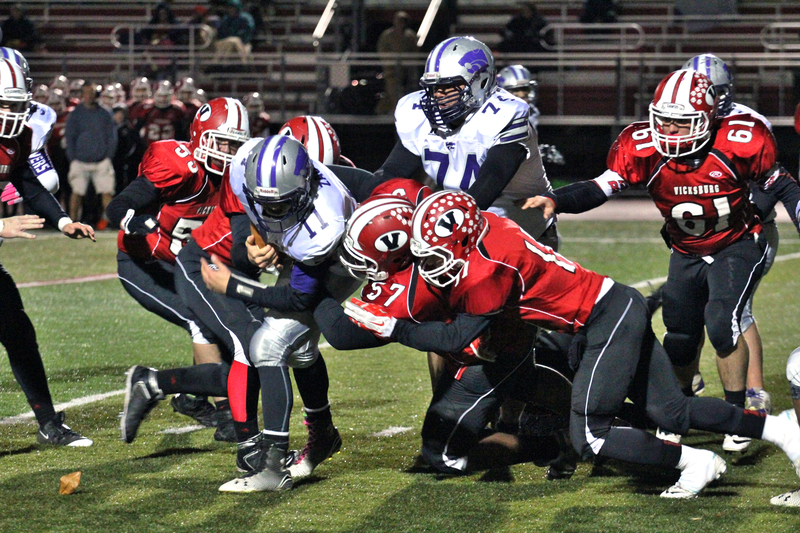 It was time for the defense to get tough when Three Rivers got the ball on its own 25. Instead the momentum started turning Three Rivers way with a tricky reverse play that took them to the 47 of Vicksburg, with Henderson making a saving tackle with 1:46 left. The Three Rivers quarterback completed a desperation scoring pass to his wide receiver to score with 58 seconds left on the scoreboard. The snap for the extra point try was fumbled and the game ended with Vicksburg taking a knee on the fifty yard line after recovering an onside kick by the Wildcats. 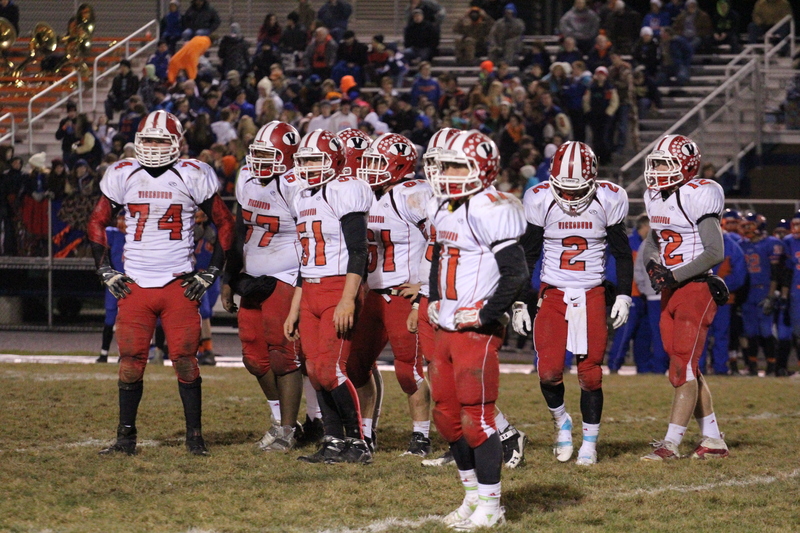 The next playoff game will be at Edwardsburg which advanced on a win over Paw Paw. They will play on Friday, November 7 at 7 p.m. Vicksburg beat the Eddies in an early home game in September. 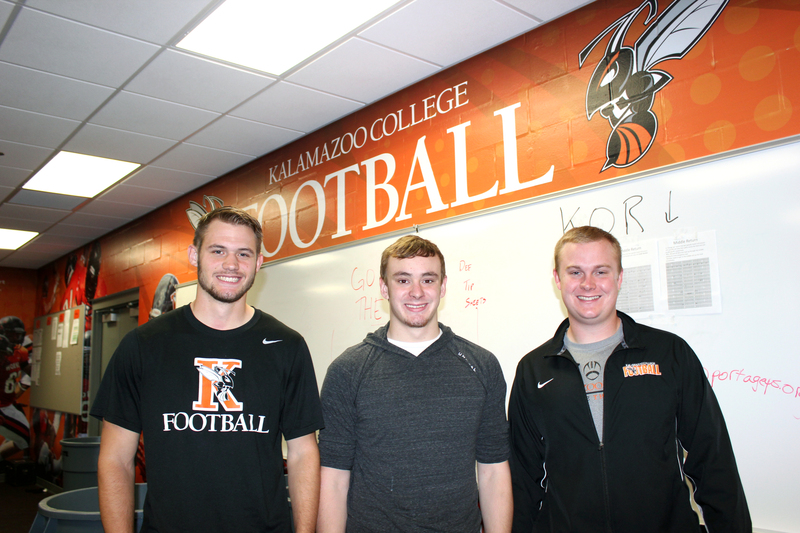 Aaron McGuire, Dan Karn, and BJ Cagney in their new locker room at Kalamazoo College. “Football is a physical game. It’s the only place where hitting is legal,” said Dan Karn, a Vicksburg High School player from the 2010 football team that earned a playoff berth. Karn is now a reserve linebacker at Kalamazoo College along with his Vicksburg teammates from 2010, Aaron McGuire and BJ Cagney. McGuire was the quarterback on the VHS team that went 6-3; Cagney was the center and Karn a linebacker. McGuire and Cagney are now senior starters on the Kalamazoo College football team that is having some troubles getting on track this season. The three have been playing together for eight years, beginning with Rocket teams, freshmen, junior varsity and varsity in Vicksburg, under the tutelage of Tom Marchese Vicksburg’s head coach for six seasons. That shows at the next level with Karn and Cagney listed as academic All Americans at K, and McGuire sporting a high scholastic average. McGuire and Cagney spent a semester in Spain as their study abroad, living with families in Madrid who didn’t speak any English. Karn stayed home to major in organic chemistry and plans to graduate a semester early, hopefully to land a job in the plastics industry involving large production. Cagney says he is straight off the farm. That had its advantages because he could recruit his teammates to help bale hay in the summer, giving them good paying jobs and providing the guys lots of conditioning work while hard at it. He intends to graduate from K with a degree in business and marketing, with an emphasis on finance. An internship with Imperial Beverage last year gave him a good start, he said. McGuire hopes his days of quarterbacking will take him to a job in real estate investments once he gets his degree in business and marketing next spring. Meanwhile, he is playing well as the starting quarterback but injured his knee during the Olivet game last week. “Our coach, Jamie Zorbo, has an infectious personality,” McGuire said. “He wants to win, is intense, and personable.” Cagney made his first recruiting visit to Kalamazoo College and then to Hope and Albion, but nobody beat the feeling he had from the K coaches. They each received academic aid, but there are no athletic scholarships at Division III schools, of which K is one. A new athletic facility has been built and opened officially during the four years these guys have been in school. It includes soccer, baseball and softball fields, training room, and an elaborate locker room facility to help with recruiting. They all agreed they need to get out in the work force first and start making some money to pay back their student loans before deciding upon graduate school. On Thanksgiving Day, wild turkey hunters in Southwest Michigan should give thanks to two Vicksburg residents, Gary Van Dyke and Tony Decker, members of Southwestern Michigan Long Beards, a local chapter of the National Wild Turkey Federation. VanDyke is president and Decker the treasurer of this group of wild turkey hunters who pursue the conservation of turkey populations and natural habitats across North America. The National Wild Turkey Federation (NWTF), founded in 1973 in Edgefield, SC, is the largest upland game conservation organization in the U.S., spending $412 million conserving 17.25 million acres of habitat. Michigan has 80 chapters. The Southwestern Michigan Long Beards, which includes Kalamazoo County, was founded by Van Dyke in 1986. The chapter was the first in the United States to become Diamond Life Sponsor in the Federation by giving over $10,000 to the national fund of the NWTF. Besides the fundraising accomplishments, the Long Beards have made huge strides in conservation of wild turkeys and other wildlife in the county and across the state. Working with other organizations like the Michigan Department of Natural Resources and other NWTF chapters, the group has helped fund the trapping of wild turkeys to replant them in Kalamazoo County and other areas in Michigan. The chapter has been a part of the repopulation of trees, pheasants, and other wildlife in Michigan. “We gave turkeys to Ontario, and they gave us moose, to help repopulate the Upper Peninsula,” said Van Dyke. The inaugural season of soccer and a No.1-ranked volleyball team were just a few of the many highlights of Schoolcraft High School’s fall sports season. In addition, both its cross country teams finished second in the Kalamazoo Valley Athletic Association and the Eagles saw their football team finish with a winning record and trip to the playoffs for the sixth consecutive season. 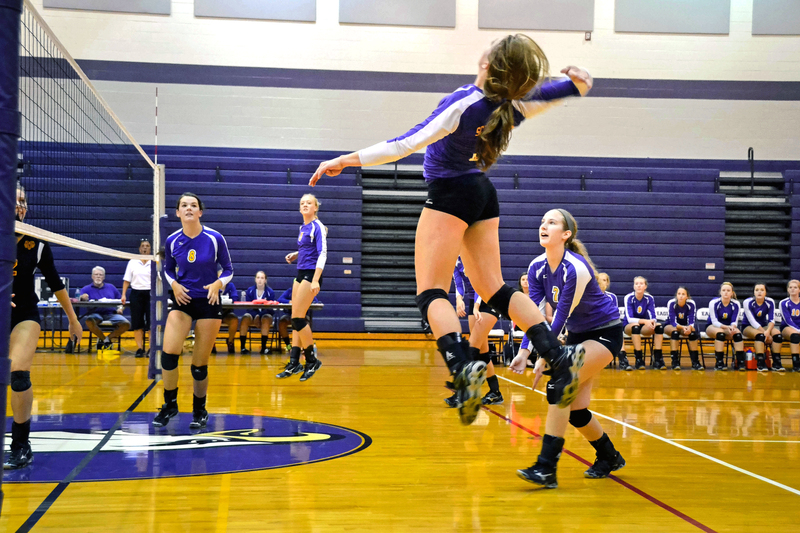 The Eagles’ volleyball squad is expected to make a deep run into the post season and hoping to repeat the fate of the school’s 2008 team, which won the state Class C title. Flynn said senior Marianne Douglas, a four-year starter on the varsity squad, is the face of the program. “Marianne isn’t big, but, man, she plays big … she pounds the ball,” Flynn said, noting the squad has six seniors and an embarrassment of riches when it comes to depth on its bench. District play starts the first week of November. Flynn said though it failed to notch a win, the school’s first-ever soccer team was a fall sports highlight. The novelty of being able to offer soccer was an exciting development for the district. He said the fact he squad showed growth from the start of the season to its conclusion was a noteworthy development. “You want to win, yes, but if you see a squad growing and developing, you know the wins will start to come,” Flynn said. “If you build a house, you can’t put the roof on first … you start with a foundation and work your way up, and that’s the analogy I like to use when I talk about our soccer team.” The squad did play to a tie twice against Three Rivers. The school will feature a girls soccer team in the spring. Meanwhile, Schoolcraft’s cross country teams made their presence known in the KVA. Led by Coach Tom Broekema, the squads had different runners every week step up and keep the Eagles in contention. Flynn singled out senior Matt Ring as “an upper-echelon runner” who consistently placed in the top three. Turnout for cross country was strong, Flynn said, noting Broekema is well liked by his runners and respected by his counterparts.